Love the location and tixked all the boxes for us. Clean, quier and very helpful, friendly sraff. Lovely room. Spoke to staff about the mini bar and they were very kind. Loved the property. Great location. Staff are fantastic. The Skye Apartments are worth every cent. Would definitely stay here again. Staff were very welcoming. Room was great. Clean and comfortable. Enjoyed the continental breakfast. Safe and quiet. Highly recommend. 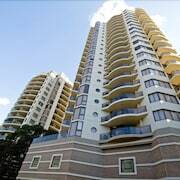 These apartments are located throughout the area in Parramatta. Need some time away from spreadsheets, KPIs and your overbearing boss? 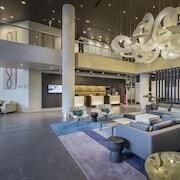 Located 20 kilometres away from the centre of Sydney, Parramatta is a fab place to base yourself while getting to know New South Wales' impressive capital. There's no such thing as being bored in Sydney. Head to big-name sights like Bondi Beach, Sydney Opera House and Sydney Harbour Bridge and humblebrag to your mates at home afterwards. For people thinking about an outing to University of Western Sydney Parramatta Campus, it's worth finding out if there are any campus tours occurring. 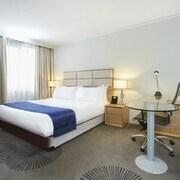 The Rydges Parramatta and Novotel Sydney Parramatta are some of the best places to stay a few nights close by. Develop your knowledge of the area's past events by exploring the intriguing displays and exhibits at Elizabeth Farm. Need somewhere to turn in around here? 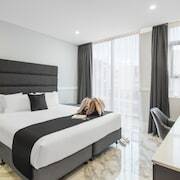 The Mercure Sydney Parramatta and Waldorf Parramatta Apartment Hotel are favourites with many visitors. 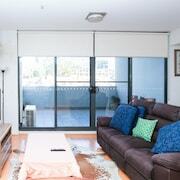 Want someplace to stay in Parramatta but don't want to burn through all your savings? 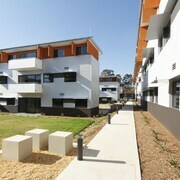 Check out the disgustingly good rates at the Western Sydney University Village- Parramatta Campus. 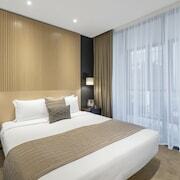 You'll want to snag a room quickly though, as there are limited cheap hotels here. Why not get your mates together and arrange night one of your well-deserved holiday over a coffee at The Perfect Mouthful? It's not far away, and there's plenty of sweet treats to keep your energy levels up. Chances are you'll all be ravenous by dinnertime, so why not make a reservation at Nonna Maria's Place? Whatever you feel like eating, the chefs will take good care of you here. You could be sensible and go back to the hotel, but why on earth would you? You're on holiday, right? Regardless, there's a bar stool calling your name at Collector Hotel! 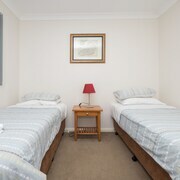 Why not chat to the gang about booking a hotel in Westmead or North Parramatta when organising your holiday? 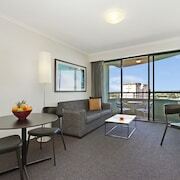 Westmead is 2 kilometres from Parramatta, and North Parramatta is approximately 2 kilometres away. Stunning sunsets and wild adventures — stop living via your mates' travel feeds! With a little guidance from lastminute.com.au, you'll be having your own mind-blowing experiences in no time at all!